Griffith is a major regional city in the Murrumbidgee Irrigation Area that is located in the north-western part of the Riverina region of New South Wales, known commonly as the food bowl of Australia. Kick off your visit on the 29th (Sat): get engrossed in the history at Griffith Pioneer Park Museum, let the kids burn off some steam at City Park, and then do a tasting at McWilliam's Hanwood Estate. To see traveler tips, reviews, and tourist information, you can read our Griffith road trip planner. Perth to Griffith is an approximately 12.5-hour flight. You can also drive. The time zone difference moving from Australian Western Standard Time to Australian Eastern Standard Time (New South Wales) is 2 hours. In June, Griffith is slightly colder than Perth - with highs of 17°C and lows of 5°C. Finish up your sightseeing early on the 29th (Sat) so you can travel to Bunbury. You'll visit kid-friendly attractions like Dolphin & Whale Watching and Apple Fun Park. 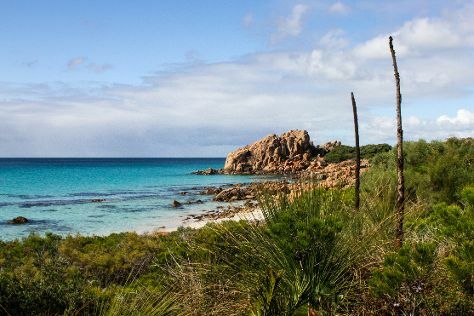 Venture out of the city with trips to Busselton (Scuba & Snorkeling & Busselton Jetty), Margaret River Chocolate Company (in Metricup) and Dunsborough (Christian Fletcher Gallery, Cape Naturaliste Lighthouse, & more). There's lots more to do: Head underground at Ngilgi Cave, get to know the resident critters at Bunbury Wildlife Park, pick up some local products at Bunbury Farmers Market, and let little ones run wild at The Gingerbread House. For other places to visit, maps, where to stay, and more tourist information, read Bunbury online trip itinerary planner . The Route module can help you plan travel from Griffith to Bunbury. You'll gain 2 hours traveling from Griffith to Bunbury due to the time zone difference. Finish your sightseeing early on the 3rd (Wed) to allow enough time to drive back home.